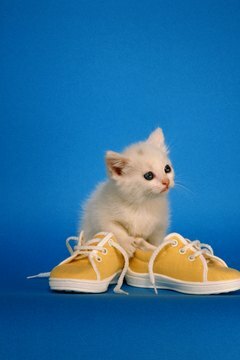 Get her spayed before she grows into those shoes. You already know the importance of spaying female cats. But you may be wondering how old -- or young -- your cat must be in order to have the procedure. You can have a healthy kitten spayed as young as 6 weeks of age in most cases. The Cat Health Guide recommends having female kittens spayed by the time they are 6 months old. The Cat Care Clinic of Orange County, California, says kittens can be spayed at 8 weeks but recommends waiting until 4 months to 6 months of age. Nevertheless, kittens can be spayed as young as 6 weeks. Kittens who are adopted from shelters are frequently spayed at this age with no complications. So the ideal age for spaying kittens is between 6 weeks and 6 months old. The general rule of thumb is that it is better to have kittens spayed early in life. As with humans, it is safer for any surgery to be performed on younger cats than older ones. Also similar to humans, younger cats recover more quickly and easily from surgery than older ones. In short, the older your kitty is, the longer it will take her to recover from spay surgery and the more difficult it will be for her. Have it done while she is young, and she will be back to her normal, playful self in no time. Many people believe it is better for a female cat to go through at least one heat cycle or even to have at least one litter of kittens before being spayed. According to the Cat Care Clinic, this is not true. Spaying prevents serious illnesses related to the reproductive system, such as tumors of the uterus, ovaries, cervix and mammary glands and uterus infection. Not to mention it cuts on the unwanted cat population. Even if your kitty is fully grown, it is not too late to have her spayed. Spaying is preferable to inviting health risks for any healthy cat, regardless of age -- though it might be too late to save a geriatric cat from some of the maladies that are more likely in unspayed cats. Spayed cats are less inclined to try to escape to find a mate. Have your cat examined by your vet before making this decision; if he gives her a clean bill of health, he should be able to perform the procedure with no problems.